How many times have you reached the middle or the end of a project and not been able to adequately describe all the steps and data transformations that have taken place up to that point in time? We’ve all been there. An idea comes to you late at night and you try several iterations of your new algorithm on an intermediate data file, only to forget what got changed where. Which parameters were held constant? Which values were changed and what values were used? GeoProMT, while not 100% foolproof, will provide the tools needed to easily document and record the changes you’ve applied to your data, models and processes. Just the act of using GeoProMT forces you to better organize and manage your data and the processes you apply throughout your project. Some might see GeoProMT as a huge time sink, especially when used within the context of an emergency response setting, but it is the systematic thought processes and controlled sequence of steps that leads to successful project results. Sitting down and laying out your project in a simple list format is useful, but the workflow diagrams coupled with the transformer descriptions help clarify the steps and the relationships between the data objects and model output. Just like a good speech coach, GeoProMT helps you – “tell them what you’re going to tell them” (Project Design) – “tell them” (Workflow and Data Transformers) – and “tell them what you’ve told them” (Report Generation). One of the many advantages of GeoProMT over classroom management systems like BlackBoard or ANGEL is the built in project design and reporting functions. Not only will students hear the importance of defining their project plans and properly managing their workflow, from lectures – GeoProMT reinforces these ideas by providing tools and controls to encourage students to provide the necessary information and complete specific data management steps (like providing or defining metadata) as they progress through their project. Professors or authorized individuals (i.e., TAs or RAs) can review the student’s progress as they define their project goals, acquire and document their data capture steps, and check the validity of proposed data transformation steps or modeling procedures. All of these important tasks and lessons are managed and reinforced as the students work on their projects. Students and instructors are kept abreast of project status by percent complete reports and graphic workflow progress diagrams. GeoProMT encourages researchers to honestly assess their project plans and data management processes as they define and work through their research. It truly fills many gaps in the learning process for students and professors. According to NSF policy (http://www.nsf.gov/bfa/dias/policy/dmp.jsp), Investigators are expected to share with other researchers, at no more than incremental cost and within a reasonable time, the primary data, samples, physical collections and other supporting materials created or gathered in the course of work under NSF grants. Grantees are expected to encourage and facilitate such sharing. See Award & Administration Guide (AAG) Chapter VI.D.4. 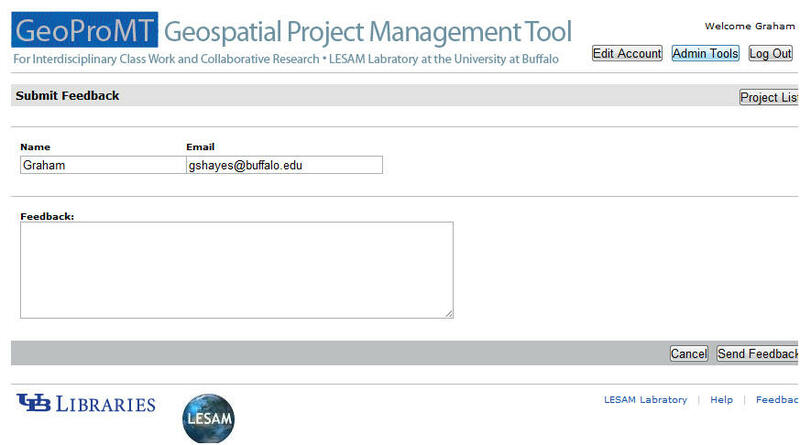 GeoProMT is an effective tool for establishing collaborative data sharing with other researchers. 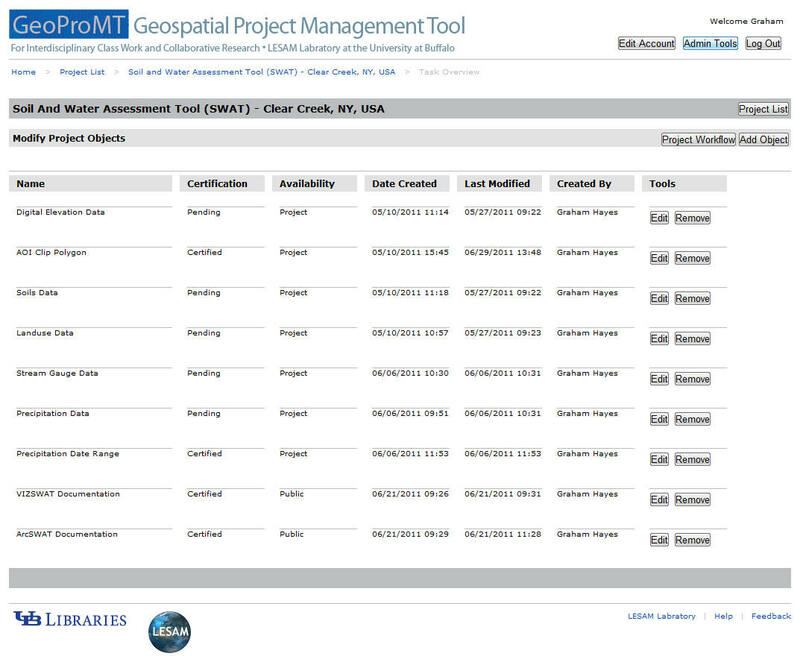 Data can be securely uploaded to GeoProMT and permissions set by the submitter to be viewed, linked, or downloaded with permission of the project administrator. Acceptable file types include, geospatial datasets, images, video clips, models, papers, raw data and final results. According to NSF policy (http://www.nsf.gov/bfa/dias/policy/dmp.jsp), proposals submitted or due on or after January 18, 2011, must include a supplementary document of no more than two pages labeled “Data Management Plan”. This supplementary document should describe how the proposal will conform to NSF policy on the dissemination and sharing of research results. See Grant Proposal Guide (GPG) Chapter II.C.2.j for full policy implementation. 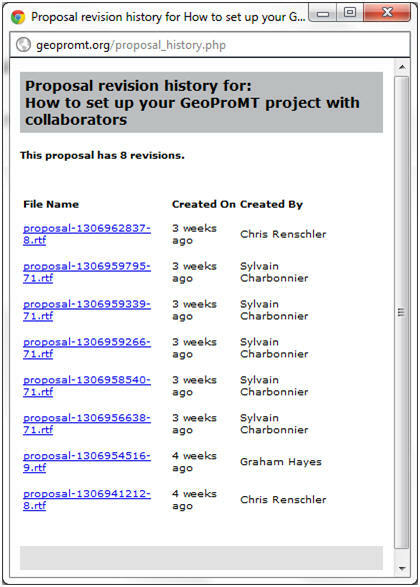 GeoProMT is an effective tool for documenting research project plans, defining data processing relationships, managing metadata, and establishing collaborative data sharing with other researchers. 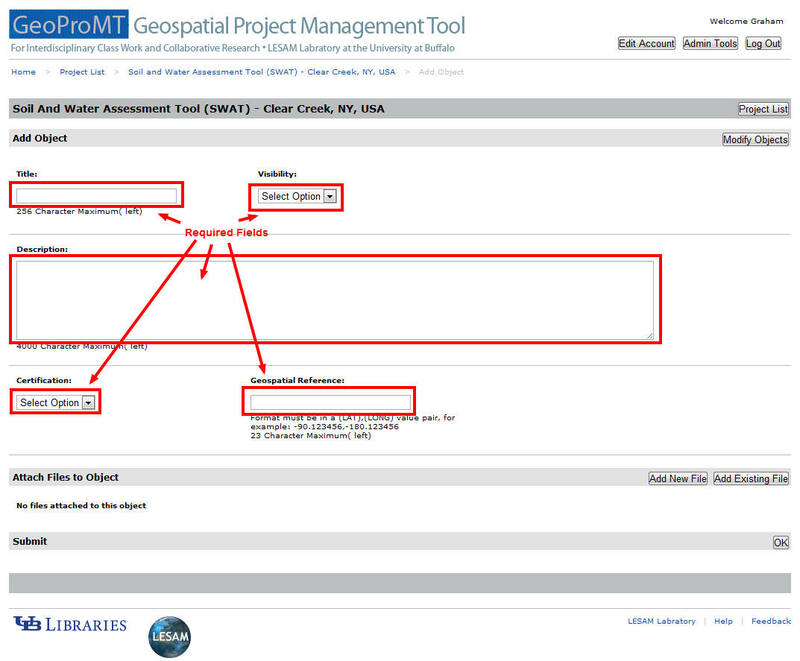 In order to effectively use GeoProMT, you need to register and create an account. 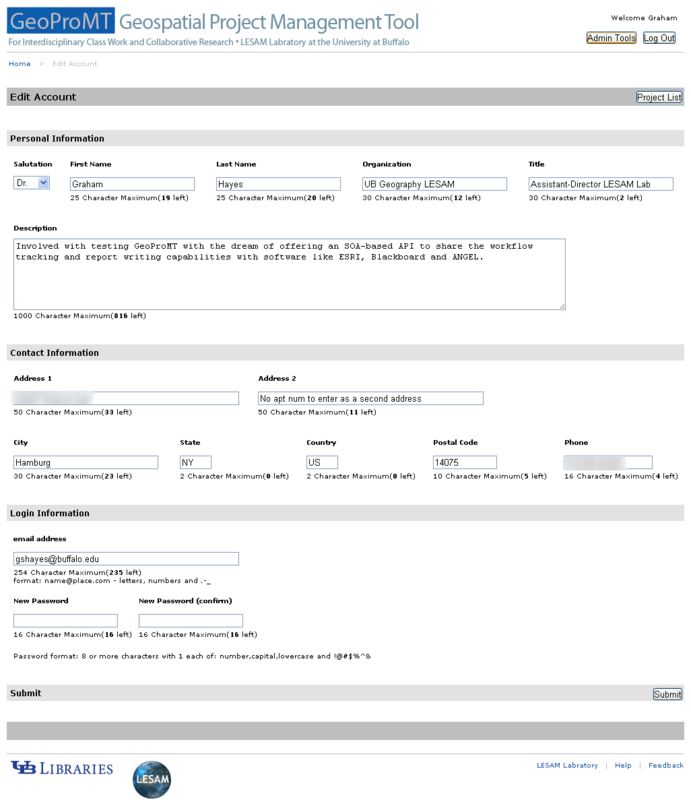 Click the Create An Account button and provide the requested and required information. Note: None of this data is or will be shared with anyone for personal or commercial gain. We are not trying to be invasive or overly personal in our quest for registration information. At this point, our programmers are more interested in capturing and testing all possible fields so every data entry field is considered required at this point. Yes, we know, most people don’t have a second line for their address, but put something in the field to make the database validation check process happy. We’ll relax those specifications once the role-based security constraints are in place and functioning properly. After you have explored a number of existing projects to understand how others have used GeoProMT to design their data workflow, transformers and expected model results, it is time to create your own project from the ground up. Starting at the Home > My Projects page, click the New Project button to launch your own project. A new page will appear and prompt you to provide a maximum 60-character title. (Note: be aware that the use of special characters is limited in the project title, so keep it simple). You will also be prompted to document the goals of the project. You can always come back and edit the text, but you might as well give it some thought and enter a good solid set of goals or objectives which encapsulates your project. You can uncheck the active status box if you want to wait till the project is more finalized before making it active, but in actuality, only team members who have been assigned to the project can see the project content. Don’t check the featured status checkbox. Only the system administrator can set and unset the Featured project status. Note: Microsoft Internet Explorer (IE) cannot insert line breaks when editing text in the GeoProMT text entry dialog boxes. Use alternative browsers like Chrome, Firefox or Safari to manage your text data entry in a WYSIWYG fashion. Click Submit to commit the contents to the GeoProMT project database. The image below illustrates a series of data entry dialog boxes which are presented to the user in order to adequately define the goals, objectives, data, methodology, and expected results for your specific project. The example below offers an explanation of what narrative should be included in each section’s dialog box. When you create a new project and begin the design process, all your dialog boxes will be empty. Note: Microsoft Internet Explorer does not handle linefeeds properly within GeoProMT. In other words, as you are entering text into any of the text dialog boxes, IE will not let you insert new paragraph spacing to make your text more readable. However, Google Chrome or Mozilla Foxfire will properly recognize linefeeds within GeoProMT. You can also incorporate references and images to help visualize the area of study, charts, graphs, timelines, etc. using the Add New File or Add Existing File buttons. The difference between the Add New File and Add Existing File buttons is the location of the file being added. The Add New File button assumes the file is being uploaded from your local computer, while the Add Existing File button assumes the file has already been added to an existing GeoProMT project to which you have been granted access to as a user. Please remember to save the project design by clicking the Save Proposal Version button. 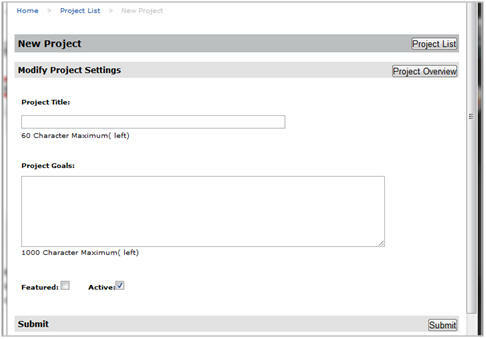 You can also review previous versions of your project design by clicking the View Proposal History button. The dialog below displays up to 10 of the last versions of the proposal document at one time. 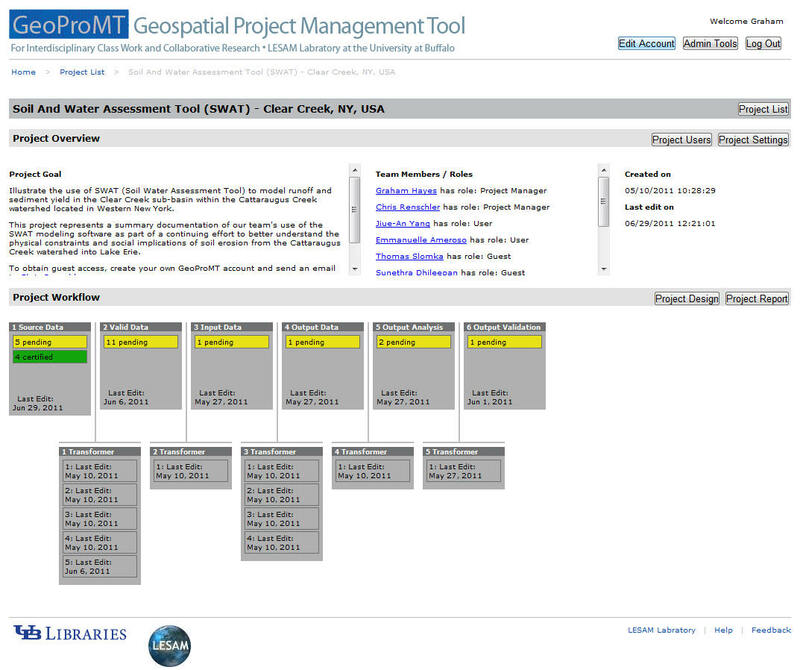 The heart and soul of GeoProMT is the visual Workflow and Transformer definition page. This interface (seen below) allows the user to plan and document the conversion, projection, enhancement, scaling, resampling, derivation and computation of all data elements involved within a given project. The boxes represent different stages of data as it progresses from left to right through the project from Source Data, Valid Data, Model Input Data, Model Output Data, Model Output Analysis to Model Output Validation. Each box acts as container to hold data objects. Data objects can represent individual data files or they can represent a folder of data which can contain more than one file of the same time. For example, a data object called Elevation Data can point to a single DEM or can contain contour data, mass points, a TIN, and a DEM. 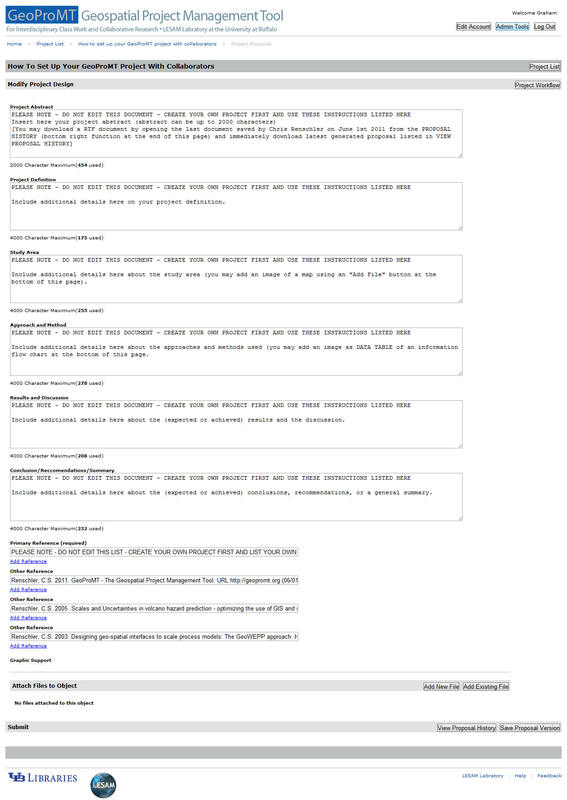 Click on the Source Data box to access the page below. You can inspect the contents of each existing data object by clicking on the edit button, or you can click the Add Object button to create a new Data Object. 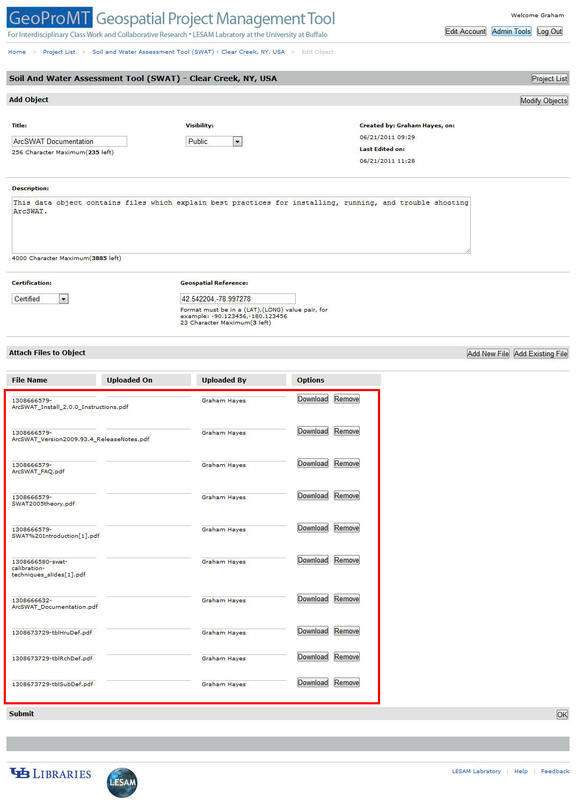 To further illustrate the concept of the data objects acting as a folder, click the Edit button next to ArcSWAT Documentation data object and look at the number of files that have been added to this single data object (see red box). To create a new data object, click the Add Object button. The red boxes below represent required fields to describe a new data object. Title andDescription are self explanatory. Visibility defines who can see this data object. By default, choose project – only members of the project team can see this data object. Certification indicates whether an independent third party has confirmed the accuracy or quality of the data being used in the project warrants their blessing or “seal of approval”. The Spatial Reference represents a single lat-long value somewhere in the middle of your project study area. Note: The coordinate values must be entered with a comma between the values, but no blank. You can associate a file with this data object now, or you can upload a file to this data object later.